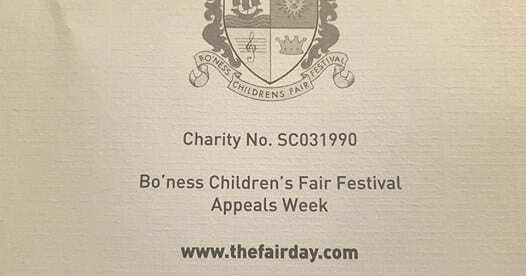 LORD EWING got it right – Bo’ness is its people and its people are Bo’ness, and our Children’s Fair Festival is a public demonstration of that fact. But the Fair is a lot more than that. It is undoubtedly the best – probably the biggest Children’s day in the entire U.K. A ady when a little girl – chosen by her classmates – is crowned Queen and reigns for a year. It is a day that she will remember always; a day that no Bo’nessian, born or adopted, ever forgets. I have memories of many things long gone in Bo’ness – the busy dock, the pits, the pottery, the Hoseries, the old Town Clock, the woodyards full of pit props, the Railway Station, the packed town streets on a Saturday night as we waited for the football results in the Green Dispatch, and many more. Funnily enough the strongest memories I have are of something which is not ” long gone ” – but is very much alive and doing very well, thank you. Our Fair. To be invited to write about them is both an honour and a privilege – the problem is – where to start? The very beginning? Yes, a very good place to . . .
All of us Bo’nessians must have youthful memories of the Fair. Awakening to the sounds of bands still stirs us. Awakening memories as well. My earliest memory is being given a small white briar rose when I was only 3 or 4 by a gentleman who lived near my parents called Greig Sheehan. A small white rose, even when school beckoned later, became synonymous with the Fair morning, when it never seemed to rain, and the sun always seemed to shine. The white rose did it, you see! My school years progressed and I remember quite clearly the coloured caps we boys wore – Blue for the Grange, Black and Yellow for Kinneil, Red for those of us who attended ” the Public “, Black and red for the Academy and if my memory serves me correctly, Purple for St. Mary’s. Oh, and pale blue and white for Borrowstuon. An unexpected bonus came when I was chosen to be a presentee. An honour indeed, for those days only one boy and one girl were lucky enough to be chosen from the entire school. I was toothbrush to Petra Johnston’s toothpaste ( there was a big push on dental care that year! ) and indeed if I have a claim to fame it is that I am the only boy who ever walked around Bo’ness in the Fair procession wearing pyjamas, carrying an outsize toothbrush, and who had TWO sprained wrists! Louis Dickson, who owned the Hippodrome, was the man responsible. His last second advice to watch his cine camera as I left the platform after bowing to the Queen resulted in me not only leaving the platform but the perpendicular, assumed the horizontal. I tripped over the grass verge, fell, and sprained my other wrist. Mr. Dickson was also the man who gave so many of us much pleasure as we flocked to his cinema the following week to see the Fair film. How many of us remember sitting and watching and exclaiming – ” there’s me!” No need for a sound track in those days – it wouldn’t have been heard anyway! The crowning ceremony was always conducted with great dignity – and it is pleasant to report that it still is today. The ceremony over, we were faced with a route march. We walked in procession along Stewart Avenue or Braehead, along Grange Terrace down Philpingstone Road, through Grangepans, the town, Corbiehall, to the Snab Brae. Up the steep hill to Ladywell Park, where we devoured the contents of the famous ” bag “, and scoffed the half pint of milk. Tired? Of course we were, but there were few complaints for this was that wonderful day of days – OUR Fair Day. And it wasn’t finished – there were still the shows at night with their own magical mixture of organ music and the smells of oil and steam from engines that powered the carousels. Heady stuff! As a youth I was a scout and a member of Guards of honour to many Queens, culminating in 1939 when we were Guard of honour to Jean Paterson. Memories? I can remember still the anxiety of her parents and family as we sat in her house waiting for the rain to stop – as eventually it did, and the crowning ceremony was postponed until midday. Jean was crowned by Mrs. D. G. Young, wife of the Craigmailen Church minister. What a wonderful old man he was – full of fire and brimstone – and heaven help you indeed if you fell asleep during one of his sermons. War was declared in September of that year and all of us eventually went our various ways to the Army, Navy or Air Force. Boys and girls of yesterday became men and women overnight. Many of our friends never returned, and those of us who were lucky and did return have never forgotten them. They – and all our other friends and family who are no longer with us , are especially remembered on the Fair Day. It’s just that kind of day. Rationing of clothes, food, sweets, shoes still prevailed in 1946 when the Fair re-started, and when Sadie Potter was crowned at eleven o’clock on that wonderful Friday in mid-July, the reading of her proclamation brought many a tear to an eye – ” That all her loyal subjects strive to live in peace, charity, and goodwill, one towards the other.” The words suddenly took on a new meaning, and the Fair to me became not just a Children’s Festival, but a symbol of friendship and camaraderie that existed then and still exists in Bo’ness today. A sense of belonging to a community that becomes a Camelot each year for a day. The Fair gradually got back to normal after the war – the green boxwood arches still straddled the main roads leading into the town at Newtown, Corbiehall and Grangepans; horses still pulled similarly decorated carts ( petrol was still rationed ) and Bo’ness United became a major force in Junior football. And when they won the cup at Hampden in 1948 before a crowd of some 75,000 the thousands of us who were Bo’ness supporters stood in the stands and terraces and sang the Fair songs!! Unforgettable stuff! From then on it seems I have been involved at the Fair in some capacity or other. I became one of those much needed helpers – a steward. Then, as a parent, I answered Headmaster Bob Robinson’s call to help build a float, decorate a school, and see to it that the real workers were never thirsty. When No.1 son was chosen to be a policeman in the Public School’s presentation of ” Safety First ” – with the help of good friends like George McFarlane, we transformed our front garden into a model village. This was probably the very first introduction of a decorated house frontage, and I still have the special prize of a ten shilling note to prove it. Regionalisation took place in 1975, and with it saw the disappearance of our local Town Council. So that our Fair could be preserved in its entirety, and not become merely another Saturday Gala Day. 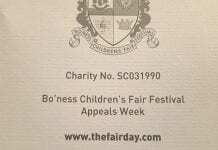 Bo’ness Children’s Fair Festival Committee was formed. 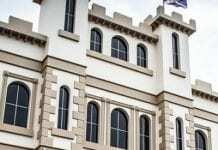 It was this body of dedicated men and women who contrived – and still contrive – each year to maintain and where possible improve the high standard set originally by the council. For twenty years or so I have been a member of that committee, occupying the dual roles of commentator at the crowning ceremony in the Glebe Park, and producer of the afternoon entertainment in the Douglas Park. 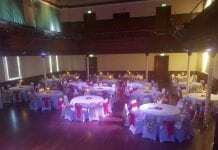 These years alone have provided some wonderful memories – the stars who have entertained in the Royal Command Performance reading like a Who’s Who of Scotland’s theatrical talent. Peter Morrison, Andy Cameron, Moira Anderson – you name them, they’ve all been here. Remember the ” Rainmaker ” – Christian himself? And how about the international scene – that fabulous American College Band – the constant flow each year of the charming young musicians of all ages from Norway – the wonderful Ukrainian Dancers. Nor can we forget the contribution made by the six local schools, who not only perform in the Glebe Park, but whose presentations have been repeated for many years now at the Douglas Park. I love the atmosphere in the afternoon. The thousands who appear year after year are relaxed in the knowledge that not only will they be entertained, but they are almost certain to meet someone they haven’t seen for years. It’s all part of the magic that is Bo’ness Fair Day. I have been asked countless times if I use a script. No, for too many things happen spontaneously, although I do find myself repeating certain phrases year after year. I suppose in time they too will become memories. 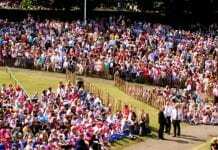 ” We have a new Queen ” – ” Three cheers for the sun ” – ” A cacophony of Sound ” ( no better way to describe the sound of bands at ten o’ clock as the schools start to enter the arena, as the Salvation Army Band finishes its programme in the Bandstand, Kinneil Band can be heard coming from the west. Carriden Band from the east, and the inevitable Pipe Band tuning up at the Public School!) Then there is my own favourite phrase ” And so, to the haunting strain of Franz Lehar’s Gold and Silver Waltz ” . . . If ever a particular piece of music has epitomised Bo’ness fair day to me, throughout these many years, it is undoubtedly the haunting beautiful Gold and Silver Waltz. This year, as lovely Kerry Simpson is crowned Queen at Bo’ness Fair, there will be many of us who will quietly cherish our own special memories, memories continuously revived by the very existence of the Fair. And as long as there is the will in the hearts and minds of the overwhelmingly large majority of Bo’nessians, exemplified by people like David Brown and Andrew McFarlane – and as long as we cherish and retain the goodwill and co-operation of the teachers – Bo’ness Children’s Fair Festival will always be what it undoubtedly is today – the Premier Children’s day in the entire United Kingdom.